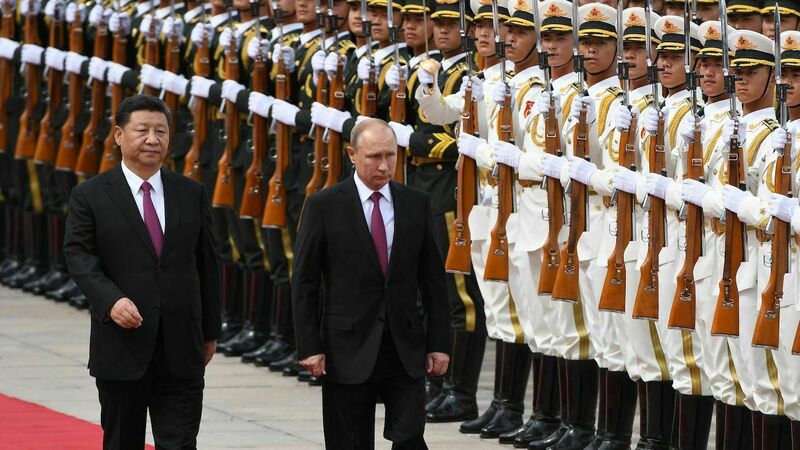 Russia’s President Vladimir Putin reviews a military honor guard with China’s President Xi Jinping during a welcoming ceremony outside the Great Hall of the People in Beijing on June 8, 2018. Russia and China pose the biggest threat to the United States and are closer than they have been in decades, Director of National Intelligence Dan Coats said on January 29. While Russia and China continue to deepen their alliance, traditional U.S. allies are drawing away from America. “China and Russia pose the greatest espionage and cyberattack threats,” Coats said in a report. “China and Russia are more aligned than at any point since the mid-1950s, and the relationship is likely to strengthen in the coming year as some of their interests and threat perceptions converge.” He listed U.S. unilateralism, democratic values and human rights as catalysts for their cooperation. While Russia and China are closer than they had been, traditional U.S. allies “are seeking greater independence from Washington in response to their perceptions of changing U.S. policies on security and trade and are becoming more open to new bilateral and multilateral partnerships,” he wrote. Coats did not name any specific U.S. ally, but he likely was referring to Germany and the European Union as those that are distancing themselves from the U.S., possibly as a result of U.S. President Donald Trump’s anti-nato sentiment and U.S. trade protectionism. The report warns that Russia and China are willing to reconcile with the allies that President Trump has been pushing away. Some lawmakers on the Senate Intelligence Committee are concerned about how closer cooperation between Russia and China could threaten the U.S. “If those two countries begin to work together systemically, that could be a big problem for us,” said Sen. Angus King from Maine. [The Mongols’ and Chinese] constant dream for centuries has been ultimate world conquest! … China knows, however, that in this highly industrialized age she can accomplish this dream only as an ally of Russia. … China is now ready to begin devouring the rest of Asia with Russia’s secret military backing. At the time of Mr. Armstrong’s death in 1986, tensions between Russia and China were still high. But events since have proved Mr. Armstrong’s forecast right. How could he have predicted the Russia-China axis before it happened? Mr. Armstrong was right. Russia and China have grown and have posed a big threat to the U.S. and other nations. Russia and China have developed a strong alliance and are fulfilling Bible prophecy. Keep watching the formation of the Russia-China axis and see Bible prophecy play out before your eyes. To understand why the Trumpet closely watches the Russia-China alliance, please request your free copy of Russia and China in Prophecy and He Was Right.